In light of current efforts to consolidate environmental and development agendas within the context of the Sustainable Development Goals (SDG) as well as the discussion and initiatives to promote transformational change in climate finance, www.deutscheklimafinanzierung.de analyzed the contribution of German climate finance toward long-term compliance with the target of limiting global warming to 2°C and toward poverty alleviation in developing countries. – the improvement of the legal, political, institutional and socio-economic framework for climate protection in the energy sector. 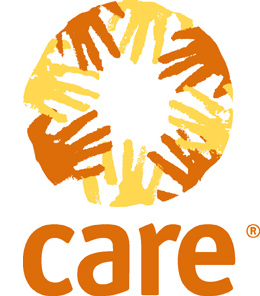 and/or the project works with the most vulnerable groups with the aim of improving their social and economic situation. A total of 211 projects accounted towards mitigation by the ministries were studied. Public project descriptions were available for a total of 60 percent of these projects. As in the previous analysis, the ICI proved significantly more transparent than the BMZ. The opposite holds true with regard to the availability of the Rio Markers. 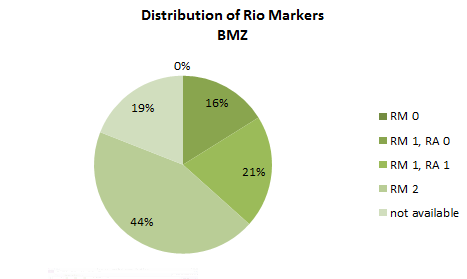 The BMZ has published the Rio markers of all of the projects in the project lists since 2011; the 19 percent of the projects for which there were no Rio markers therefore date back to 2010. In the case of the ICI, by contrast, Rio markers can only be determined using the OECD files. Due to these difficulties, it was not possible to determine Rio markers for 10 percent of the projects. 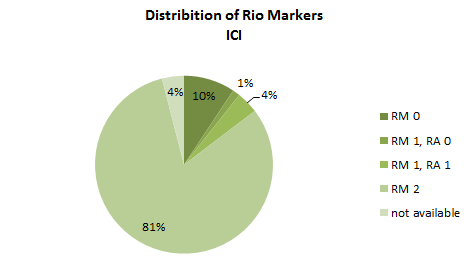 An analysis of the Rio Markers for the projects shows that 52 percent of all projects have a Rio Marker of 2 for mitigation (RM). It can therefore be assumed that they are designed to achieve long-term climate-friendly development beyond the duration of the actual project. This is true for more than 80 percent of ICI projects, while it applies to less than half of the BMZ’s projects. The BMZ, however, has considerably more projects that have mitigation and adaptation as equally important g oals. 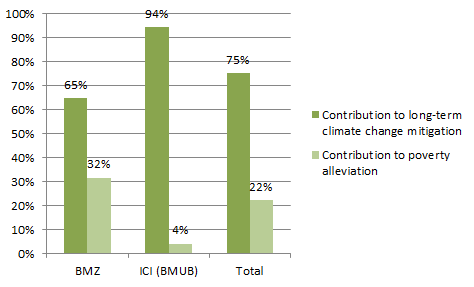 At least 21 percent of the BMZ projects have combatting climate change as a secondary goal and thus only carry a Rio Marker of 1 for mitigation. The projects thus do not explicitly pursue the goal of contributing to long-term decarbonization with their activities. The analysis of projects based on publicly available project descriptions also shows that German climate finance projects have a considerably stronger focus on reducing emissions than on a broader approach combining poverty reduction and sustainable development paths. Mitigation: With regard to the ICI (BMUB), 94 percent of projects are expressly designed to make a lasting contribution to long-term decarbonization and climate-friendly development of the host countries that extends beyond the duration of the project. In the case of the BMZ’s general financial and technical cooperation (FZ/TZ) and Initiative for Climate and Environmental Protection (IKLU), this can only be said for two thirds (65 percent) of the projects. Poverty: Only four percent of the ICI projects state poverty reduction as an explicit objective in addition to their climate-related goals. 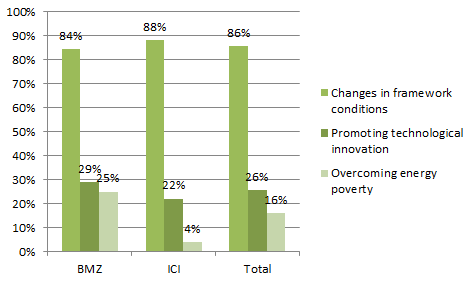 By contrast, poverty reduction as a focus in objectives and measures or work with particularly vulnerable population groups features in one third (34 percent) of the BMZ projects studied. While these problems exist at very different levels, the technology issues in particular will require an in-depth discussion about their role in German climate finance. 86 percent focus on improving the legal, political, institutional and socio-economic framework of the energy sector. They cover a broad range of measures, including the improvement of laws and regulations, capacity building for national and/or local actors, publicity campaigns, improving planning processes, the development of monitoring systems and the like. Furthermore, a stronger focus on current UNFCCC processes such as NAMA and low-emission development strategies (LEDS) can be made out in the case of the ICI. 26 percent promote the introduction of climate technologies or technical innovation. The two ministries differ in their approaches, however. While the ICI generally supports pilot plants as well as technical innovation in the field of renewable energy and energy efficiency, the BMZ focuses mainly on KfW projects involving the construction of large-scale systems in the field of solar and geothermal energy, as well as the improvement of transmission grids. 16 percent have both climate change mitigation and poverty reduction as explicit focus areas. These projects thus follow the approach of combining the fight against poverty with protecting the climate, either by giving climate protection projects a poverty-reducing orientation, or by adding a strong climate focus to development projects. Many projects contain elements of both areas, even if the focus lies on one. Ten percent of the projects promote both technological innovation and changes to framework conditions to an equal degree. The participation of civil society is a central element for the development of coalitions and the promotion of social acceptance for changes in the energy sector; these are key factors for the promotion of transformational processes according to a research project by the Wuppertal Institute. In German climate finance, however, only 29 percent of projects with a climate focus explicitly call for civil society participation in project planning and implementation. All of these projects put the focus on changing the framework conditions. With 30 percent for the BMZ and 28 percent for the ICI, no appreciable difference can be made out between the ministries. Overall, it can be said that German climate finance reflects the current state of the debate particularly in those areas that correspond to the profiles of the respective ministries. A systematic anchoring of new developments and debates around poverty reduction and transformational development paths and a coherent orientation toward those ends cannot yet be made out, however.